Crop the image to the appropriate size2 and save the change. Looking for a faster way to add images for people? Take a look at updating photos through check-in. Navigate to the profile of someone in the family. Click the gray header over the family section and then click "Add Family Picture." 1 Images must be in jpeg, png, gif, or bmp format. Photos are required to be a 3x2 ratio. If you have a picture in portrait mode, you will be given a black border around the photo in order to include the entire photo in the image. Simply upload the squared or portrait mode photo and Breeze will automatically include the black border around the sides. Hey everyone! We have an update with our images that will include a black border around the sides of images that are portrait/vertical or squared. This should help prevent any cropping of images! Hey! I have a photo of a family that keeps coming in sideways and I can't get it turned.....is there a way to do that in Breeze once it's in there? It's saved the right way in my computer but when I bring it over it's not??? Any ideas? Will there ever be a time where we can take a photo on our phones through the app and have them be set as a user profile picture? Select the option where the photo is located and then select the photo. Scroll down past the photo that is uploaded and select the green Set as Profile button. The photo will be saved Profile picture. While solutions for your original request may not be on the Development Roadmap at this time, it is most certainly appreciated and helps us know where the churches we serve are at. Would you mind telling me what file size a profile picture needs to be in order to upload to Breeze? I'm looking for a pixel size for a "landscape" oriented photo. Thanks! Hey @tgriffies - great question! You can put any size picture into Breeze and Breeze will automatically resize and help you crop it to fit your needs. The ratio that we look for is a 3x2 - so that may help in the direction that you're trying to go, but you shouldn't feel the need to crop down every picture to 3x2 before uploading it into Breeze because we have a tool that will help you do it as soon as you upload. So, to recap, any pixel size will do, but we are looking for a 3x2 ratio. We'd like to set up a form for our congregation to submit updated photos. Is there a way to automatically upload/connect those images directly from forms without having to individually save/upload/crop EACH of those hundreds of photos to the profile? i.e. 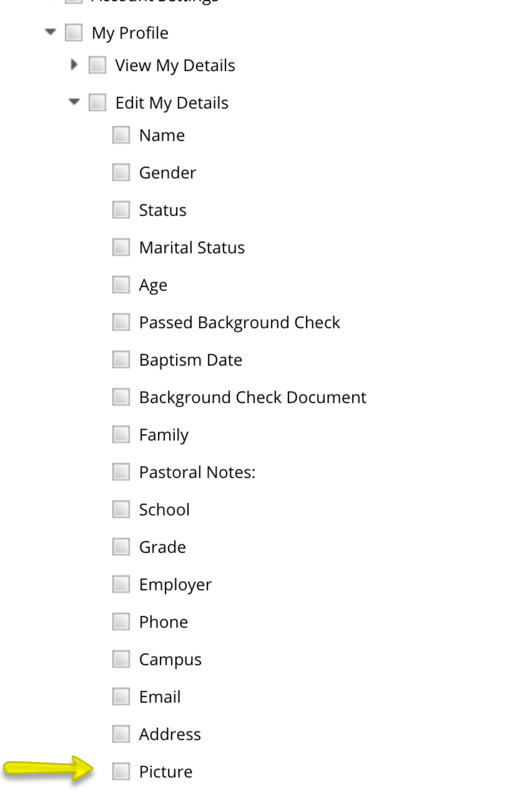 if an email address in a form is different than the profile info, it gives you the option to automatically update that information from the form. We'd like to be able to do that with photos. Is there a way to upload/edit family photos without giving full access to edit members of the family also? As long as you have "Edit My Details > Family" you can edit the picture. Just simply remove "Access to my Family Members". You will be able to edit the picture but can't add or remove anything for the family. I tried to upload a picture and it was loaded so big that all I can see is the top left corner of the picture. I was not given any way to make it smaller, just given that top left corner to crop and size. Now I would like to just delete it, but I can't find a way to delete it. I hope this helps! Be sure to let me know if I can assist further.